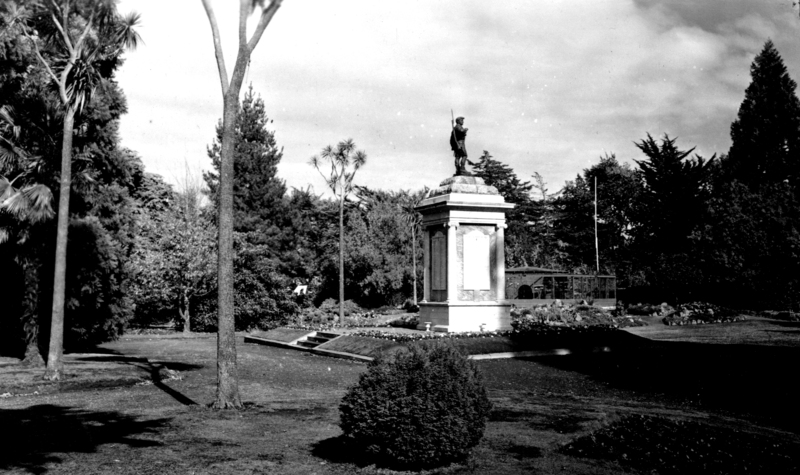 The Wairarapa Soldiers memorial, commonly called the cenotaph in Masterton Park about 1940. A Masterton group of sports clubs wanted a sports ground as a World War One memorial. This eventually resulted in Cameron and Soldiers’ Memorial Park but other citizens wanted a more traditional cenotaph. The dual projects were managed by the same committee, which canvassed for funds and names for the memorial. The prominent four-sided marble memorial is surmounted by a bronze statue of ‘The last Anzac’ by Frank ‘Guy’ Lynch, modelled on his brother Joseph. A similar statue was later erected at Devonport, Auckland. Masterton Borough Council agreed to house the memorial in Masterton Park (later Queen Elizabeth Park) and officially accepted the cenotaph just before its unveiling. Returned serviceman and government minister William Downie Stewart performed the opening supported by local dignitaries including Brigadier-General Herbert Hart. Major campaigns are inscribed around the memorial and World War Two names were added to the cenotaph.